This is quickly becoming our favorite pot set. Stainless steel and robust, they are easy to use and clean in every camping setting. Just a little bit heavier than other pot sets, the thicker metal helps distribute heat more evenly. 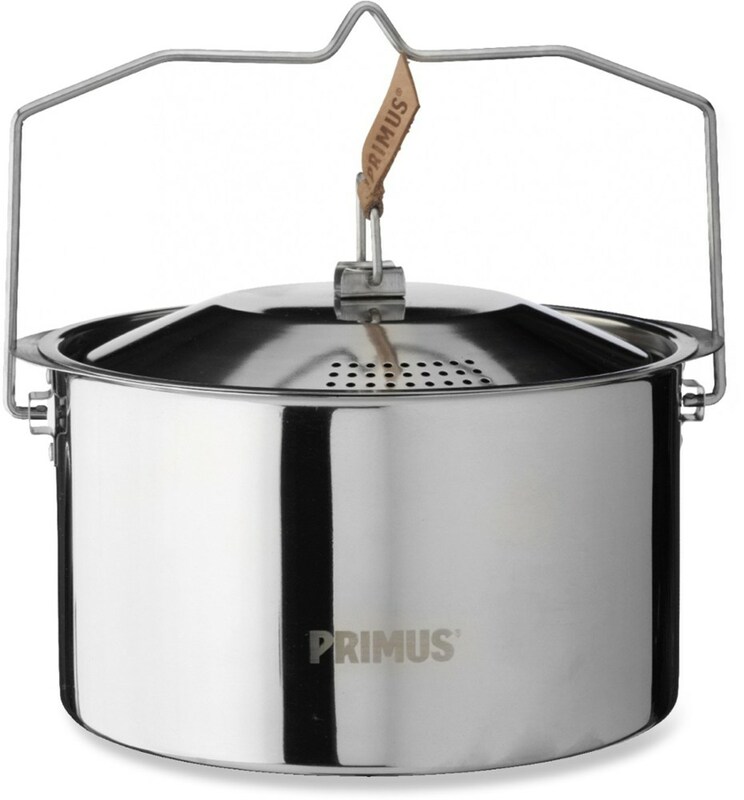 As members of another website, we received this Primus Campfire Cookset for product testing in exchange for a review. We've used it on our 2-burner propane stove in our adventure rig, over an open camp fire, and on our backcountry stove. We’ve had the same backcountry pot set for nearly 20 years and it’s held up well, but this one has some extra features which we like even better! We’ve made everything from soup to pasta to chili to omelets so far, and our creative “foodie juices” are flowing. 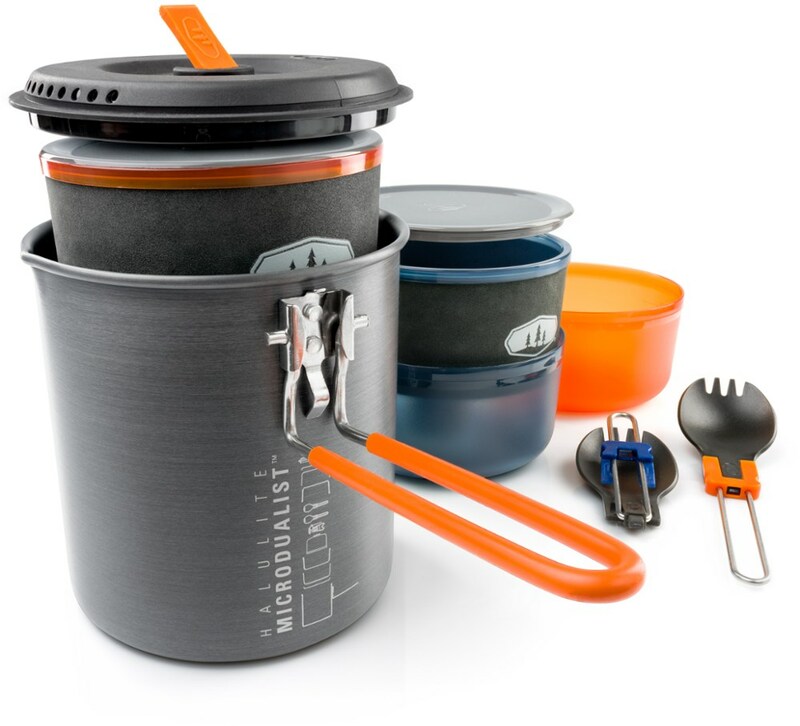 The two nesting pots and sauté pan pack down to a nice size for both backpacking and sea kayak camping, and easily fit into their carry bag. Each pot has a different style of foldaway handle, unique to the size, weight, and use of the pot. The leather tabs on the lids/handle allow you to remove the lids without a pot grip or oven mitt. 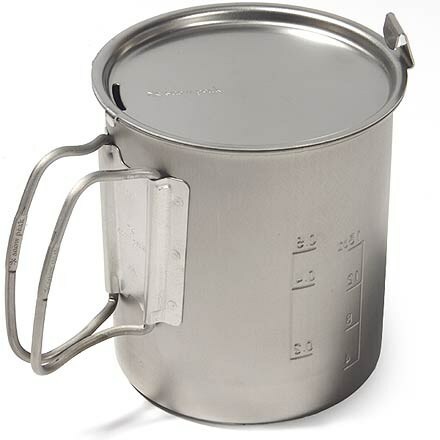 The largest pot is a 3L capacity. 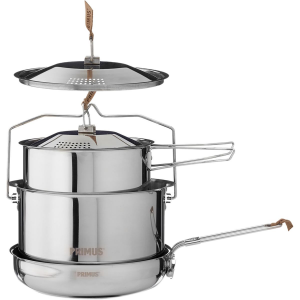 That’s a ton of capacity, so it works great for soup, pasta, and can easily feed a hungry group of four. The sauté pan makes a great omelet pan! Eggs slide right off with just a bit of oil in the skillet. 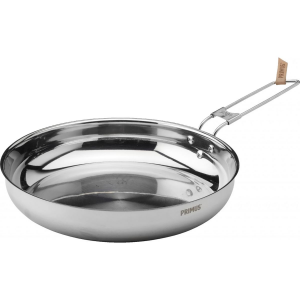 Everything is made out of durable stainless steel so it is easy to clean and should stay rust free for many years. The steam vents on the two pot lids are great for preventing boil-overs and for straining out liquid. 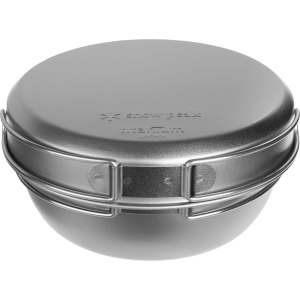 If the 3L pot lid was large enough to fit over the sauté pan, that would be a great addition as you could keep food warm while something else is still cooking. When out in the backcountry, everything you bring needs to be sturdy, and it’s great if it has a second use. The first time we used this set, a hole appeared in the bottom seam of the bag. It’s an easy fix with some needle and thread, but was disappointed that it wasn’t more robustly constructed. Also, if the bag was made out of something that would hold water, it could serve as a small wash bucket as well as a bag to keep the stack together. Include a set of pot insulators (or sell them separately), so that soup and pasta stay warm well after you’ve taken them off the fire during the colder months.